Day 5 of our Morocco Adventure was spent experiencing the Marrakesh Medina in all it's twisty-and-turny glory. It's not supposed to be a question of whether you'll get lost traversing the narrow alleys of the souks, but how often and how severely. For my part I handed the map to Shira and stood back as she navigated. Needless to say, we didn't get lost once. Shira: 1, Marrakesh: 0. The souks really are pretty endless here, with always one more set of stores around the corner. Along with shopping we hit a number of guide book recommended sites, which didn't disappoint. There was a medrasa, much like the one we saw in Sale, but about 10 times bigger. 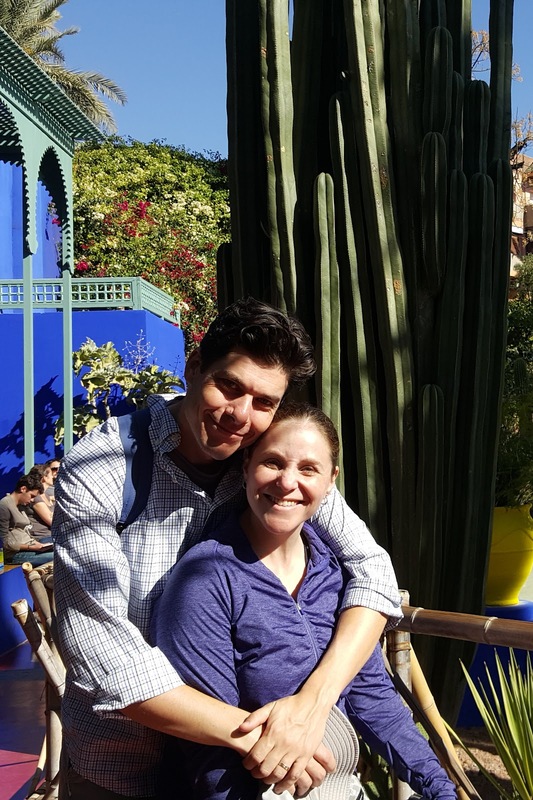 Outside of the Medina, we hit the Jardin Majorelle, which includes a remarkable cactus garden, not something you'd immediately associate with a relaxing garden. But it totally works. The garden also offered a museum, which I insisted we visit (it's our first of the trip, thank you very much). The topic was on Berber culture; Berbers being the indiginous people of Morroco (versus the Arabs, who arrived later). Here's the part that blew my mind: there were Berber Jews, and the museum had a pretty healthy exhibit on the topic. On one hand, this shouldn't be surprising; there are American Jews, and French Jews, etc., so why not Berber Jews? On the other hand, I just didn't see that coming. Alas, the whole movement is effectivly wiped out (as is most of Morrocan Jewry). But man, that would have been a sight to see: Jews that dressed and spoke Arabic just like their neighbors, but of course, were Jewish. After the museum, it was back into the souks for more oggling and shopping. There's a sort of arms race between the government and the con-artists that work the tourists in the souk. Over the years the government has worked hard to make the souks a friendly place for tourists. The latest effort involves a large number of undercover "tourist police." The idea is that the shabbily dressed man loitering on the corner is actually a police office, ready to jump in and save a tourist. The con-artists, for their part, have figured out more ingenoius ways to rope in toursts, all while not getting caught. We were warned about this extensively by our hotel and knew to expect it. So when someone came up to us a few blocks from the museum and started chatting, we weren't surprised how the conversation went. First he told us that he worked in the gardens and saw us there. What did we think of them? Then after a bit of chummy back and forth, he asked us if we wanted to see a one day only Berber market (I could hear our hotel advisor: "I can promise you, there's no one day berber market going on today, or any day). It didn't take any more than a couple of no thank yous to have him move on. The upshot to all this is two fold: first, I really do believe you're safe in the souks, and good for the Morrocan police for for making this possible. Second, it really is unfortunate that the only pople who stop and chat with you are out to con you. We spoke to a few more people throughout the day, and sooner or later, they all got around to asking if they could lead us off to some market or site. That's such a shame. In most other countries, the casual interaction with people can be a true delight. In Japan, one group of ladies stopped to ask how we liked the country. Shira and I eagerly waited for a catch, but no, it never came. They just wanted to chat. The shopkeepers for their part aren't nearly as sleazy. They're shopkeepers, and experts at being on the right side of the bargain. But we had a number of positive experiences with them, whether we bought or not.